I was browsing around web, looking for new post ideas. Then I found an amazing website, where they shared a lot of useful blog post ideas and decided to share them with you. Review books/products/films – Reviews deliver a lot of valuable information to your followers and people are constantly looking for honest opinions, not the fake ones that the web is full of. Make a guide/tutorial – If you’re a professional in a field or know some topics extra well, feel free to help the ones who have less skills and experience than you do. Tutorials and guides help people a lot. Interview someone – Know any famous or people who have great stories behind their work/life/career? Interviews are extremely popular in two cases: a) you deliver an interview with a famous person who speaks very rarely in public or b) it shares really useful and practical tips and content. Make a post full of GIFs – GIFs are the symbols of online entertainment and humor. There are thousands of GIFs and generators that help to produce new ones. Create a photo post – Share your favorite photos from your niche or personal photos from your latest traveling adventure. Keep in mind that if you’re not the author, always give credit to the original photographer by providing a link. Giveaway – Have you ever thought why products like GoPro or any other become more and more popular with each day? They do giveaway campaigns regularly. People love free stuff and it helps to reach new audiences. Create a list of something – People are lazy, they don’t want to waste time on searching and gathering information. That’s the reason why lists are popular. Create TOP 10 or better yet: TOP 100 lists, lists of movies, books, influential people or any other topic. Announce that you’ve turned the comments into “do-follow” so you can get more comments – You will probably get 50% more comments in that way. However, the downside of this technique is that you might receive a lot of “spam” blog comments as well. Share your favorite blogs/bloggers in one post – It’s a bit similar to “Make a list” idea but sharing the blogs and bloggers you follow is never a bad idea. Give the resources to your readers, believe me, they are grateful and won’t stop following you. Invite your readers to submit guest posts – Are you struggling with new posts or have to leave for some time? Ask people to write guest posts. It’s a win-win situation, you get the content, they can build up their name or brand. Publish the best comments that your blog has got throughout the history – Are you using a vote system on your comments or just know the posts where some comments have raised very fruitful discussions? Share them in a separate post. Produce or publish your art – Online galleries and portfolios look cool and can be the first step to the world for artists. So publish your paintings, comics, graphical design masterpieces and other stuff as well. Publish a post about your success and epic failures – Being successful means doing mistakes or in other words failing. But failing is not bad, it’s a learning experience to be better the next time. So, that’s the reason why you should talk publicly about your success and failures, to let others learn from it. Ask your readers to tweet, like and share the posts they like – Spreading the word about your blog or posts is important but sometimes people need a little extra kick to do that, so write a post for that. Write a post about things you regret doing/not doing – When you surf around Quora or Yahoo Answers, you’ll find many very popular topics and posts about the things people regret doing and not doing. Try to write down your own list. Write about the most important lessons you’ve learned in your life – What is more kind than helping others and analyzing yourself at the same time? Make a post about your most popular posts - Gather the data behind the most popular posts (traffic, shares and comments) and write them down in a single post. Share food recipes – Don’t know what to write about? Share the recipes of your favorite meals and desserts. Ask for general feedback on your blog – Sometimes you can improve your blog by the way your readers want. Minor tweakshere and there can add value that can bring you more traffic and returning visitors. Write the list of things and activities you want to do before death – Ever seen the books in the bookstore called “1001 places to visit/foods to eat/artists to listen before you die”? Build your own list and inspire others to do that as well. Questions and answers blog post - Make a “Questions Monday”. Promise to answer all the questions your audience has. Make a handwritten post and publish it by taking a photo - Hand-written texts look amazing and show your creativity as well as character. Publish a post as an audio file (mp3) - Write your post and record it as an audio file. It allows the readers to follow the blog on the go, all they need is an mp3 player or a smartphone. Create a list of online tools you find useful - There are literally dozens of tools that can make life a lot easier, create a list of the ones you use or would like to use. 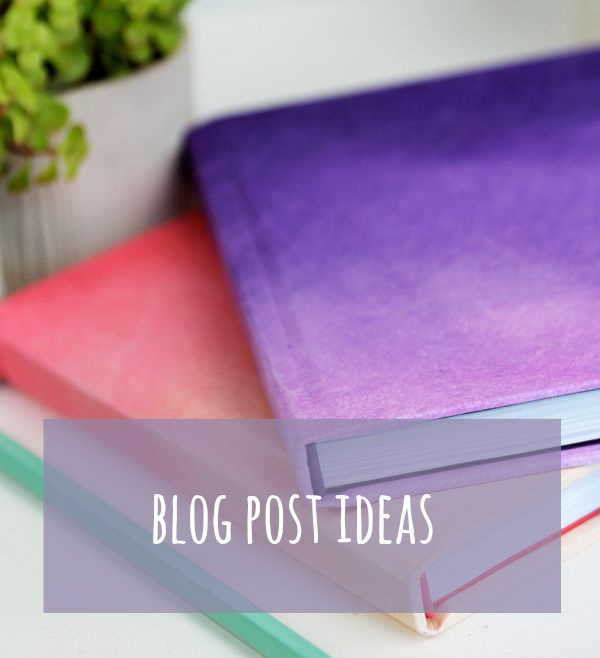 Write a blog post about blog post ideas in your niche – List down 101 blog topics in your niche, a lot of people find it useful.